This post's title is very carefully worded: this is about why I decided to vote No. This is not the same thing as why I am voting No. This is about the deciding moment: the straw that broke the camel's back, if you like. We don't celebrate this enough! Before I start, let me just say one thing that neither side has given the other enough credit for. We are having a referendum, and a 50.01% vote will decide it. The Yes side have not given the Noes, and David Cameron in particular, enough credit for the fact that they will accept the country being ripped apart by a wafer thin vote. Compare situations like Quebec in Canada or Catalonia in Spain, where even a solid referendum majority might not be accepted. From the Noes, there's not been enough credit to the Yes side for the fact there's been no hint of serious violence at any point, not just now but for decades. Maybe the odd barfight or twitter trolling, but compare almost any other country's independence fight. This shows all of us what a great country we live in, both Scotland and the United Kingdom. I always expected to vote No because I always felt I was a unionist. Much of it is emotional more than logical. I was brought up in England by a Scottish mother and English father. I have degrees from English and Scottish Universities. I have lived in Scotland for more than 20 years. I have spent years of my life in Wales - split up over many family holidays throughout my life - and my sister and mother now live in Wales. All of these have always felt to me to be part of the same country, they still do, and I want them to remain that way. But while I always expected to vote No, I wasn't sure. Maybe there would be the killer argument that convinced me to swap to Yes. While this never came, neither did the killer argument to vote No. What was it that decided me finally? It was the currency union issue, which came to the front earlier in the year. But not in the way you might expect. I don't think it matters very much whether there is currency union between between Scotland and the rest of the UK (from now on just "rUK", since it's important not to use England as shorthand for England and Wales and Northern Ireland.) The other options are all credible and not obviously disastrous. Scotland could use the pound without formal currency union, it could form its own currency (either linked to the pound or floating), or it could join the Euro. Compare and contrast the standard Yes position on currency union and the debt. It's Scotland's pound as much as rUK's! We are leaving the UK. We get to keep control over the pound whatever rUK says! It's the UK's debt! We are leaving the UK. We get to throw away the debt if we feel like it! The two issues are the same yet many Yes people treat them exactly opposite. On the debt, all government debt was by definition taken out with the UK government. Scotland would leave the UK and would therefore not be liable for it. For that reason the UK government committed in January to honour 100% of the UK's debt whatever happened in the independence vote. But this doesn't mean that Scotland gets to wave goodbye to its debt. But the Yes campaign talks as if Scotland's share of UK debt is some kind of optional extra which Scotland can take or not as it wishes. The situation is exactly the same with the currency as with the debt. By voting to leave the UK the Scottish people would be voting to leave the pound. Just as it is voting to leave the formal legal obligation to the debt, it is voting to leave the formal legal control of the pound. But unlike the debt - which is treated as a "maybe aye and maybe hooch aye" deal - Scotland's choice is taken as absolute over control of the pound. If it wants it, it gets it. Apparently, Scotland can decide if it has control over the rUK currency, but rUK is not allowed to decide if an external country controls its currency. What is often said is that Scotland should receive it's fair share of the Bank of England's assets, and I completely agree. The assets are things like its gold reserves, debt it is owed, and so on. (Not the key point, but interestingly there are several hundred billions of UK debt owed to the Bank of England because of quantitative easing, of which Scotland should get its share.) So if the Bank of England's assets are (say) $500 billion, then an indy Scotland should get about $40 billion. On the other hand, many people treat the pound as part of the assets of the Bank of England. The pound as a currency is not an asset. It's a medium of exchange in the UK. It's not as if the UK is still on the gold standard and theoretically has reserves equal to all the money in the country. In any case, it's indivisible. And being indivisible, it would obviously devolve onto the rUK. But it's not an indivisible asset, because it's not an asset. If you still think the pound is an asset, here's what to do. Put a value on it and ask in negotiations for about 8% of its value. If you think the pound is an asset worth a trillion dollars, ask for $80 billion. Obviously, as an asset, people can get different valuations but they'll be in the same ballpark. For example, the UK embassy in Washington might be worth $100 million or it might be worth $200 million, but some kind of estimate could be reached. If you're convinced the pound is an asset, value it. This is more or less a thought experiment: I can't imagine anyone being able to put a value on the pound, because it's not an asset. The argument is pretty much the same as this: "We like having a permanent seat on the security council of the UN, and this seat is as much Scotland's as rUK's. So after independence we'll have a permanent seat one month a year and rUK can have the seat the other 11 months." Insisting as an absolute right to partial control of the pound after independence makes as much sense as asking for a permanent seat at the UN one month a year. So my position is this, and is the same for both pound and debt. If Scotland is independent, negotiations should include a fair solution to the question of what currency Scotland should use. If Scotland is independent, negotiations should include a fair share of existing UK assets and debts, on an agreed payment basis. There is no direct linkage between debt and currency. Both are important negotiating points, along with very many others. And it is precisely because of this last point that I decided to vote No. After the currency question came into focus earlier in the year, with Osborne's intervention, it gradually became clear to me that pretty much all the SNP establishment believes it's reasonable to say that if they don't get their way with currency, they do not take on any debt. This is completely wrong. It's immoral and - probably worse from the current point of view - it shows that the people involved have no idea how countries work when they are independent. Countries have debt and - except in extremis - they don't renege on their debt. It's completely reasonable - of course - for the Scottish negotiating position to start as wanting currency union. It's also reasonable to expect some recompense if they don't get their way on currency union. What kind of recompense would be reasonable? For example, denominating debts in a new Scottish currency instead of pounds, or in dollars or in euros. Or agreeing that the debt would be on the interest rate the UK pays instead of the rate that Scotland would have to pay on the open market (higher since it would have no credit rating.) There are probably lots of other options. But that's not the way the Yes campaign thinks. It takes as axiomatic that no currency union = no debt. So an important but not critical point is equated with hundreds of billions of pounds of debt. Scottish politicians talk as if deciding to refuse currency union is the same thing as giving away debt. What does getting currency union mean? For all practical purposes it would mean Scotland getting to appoint one member of the Bank of England monetary policy committee. That currently has 9 members, the Scottish Prime Minister would get to appoint a new one, with probably another one from rUK to make a total of 11 for an odd number to avoid ties. There's been talk of the Bank of England becoming lender of last resort to rescue Scottish banks, which is a big deal, but if this happened it would probably mean massive contributions from the Scottish government. And is currency union sustainable? Ask the Czech Republic and Slovakia. They agreed currency union in the velvet divorce. It lasted 6 weeks. What does discarding its share of UK debt mean? Well, the number Salmond uses is about £120 billion. With roughly 5.3 million people in Scotland, this is close enough to £20,000 per person in Scotland. The SNP position is - seriously - each Scottish person should get a present of £20,000 from the rUK government, if it doesn't get its way on currency union. Except it's not £20,000, it's close to £40,000 per person. Why? Because the debt of about £120 billion as Scotland's share is net. The UK's "whole of government accounts" say that "in 2012-13, the public sector liability was £2.9 trillion. Taking into account its assets of £1.3 trillion, the net liability was £1.6 trillion." I assume that the £120 billion comes from £1.6 trillion times 0.08 = £128 billion, close enough. Obviously Scotland wants (and should get) its fair share of current UK assets. But the Yes campaign want the assets independent of debt, they want the assets and no debt if they don't get currency union. So actually the position is that it wants to forego about £230 billion of debt, while taking about £100 billion of assets. So it wants a present of about £230 billion from rUK. Roughly £40,000 per person in Scotland. The Yes campaign wants to found Scotland as an independent nation on the idea that we take a present of £40,000 per person from citizens of rUK. And this is on an imaginary equation between this outrageous pickpocketing, and a fairly minor negotiating point on the currency, which on nobody's imaginings can be worth £40,000 or even £20,000 per person. I think I would like Alex Salmond if I met him. I also think he's an incredibly able politician. But he - and people who think like him on the debt-currency equation - are far too dangerous to be allowed anywhere near control of a major independent nation like Scotland. It's often said by Yes campaigners who understand that not all potential Yes voters are SNP supporters, that this is not a campaign for one man or one party to lead Scotland. This is true enough. But the currency/debt equation seems to be widespread, and not in one man's head. And on the current plans of the Scottish Government, not only will all negotiations for independence be under their control, but there will not even be an election before independence. That is, the first prime minister of Scotland and guider of negotiations and writer of provisional constitution would be Alex Salmond (or possibly his successor as SNP leader). Alex Salmond is smart. From the very start of the serious independence debate, he has known that currency union won't happen. This is not because of statements made by Osborne or Balls or Alexander. The UK has spent years not joining the Euro because of the potential loss of sovereignty. Can anyone imagine ceding even partial sovereignty over UK finances to Edinburgh moments after Scotland has left the Union? It's totally irrelevant whether or not it's in the rUK's best interests or not. (Every country has the right to do things that are against its best interests.) For political reasons, even if not for economic, certainly rUK will not form a currency union with an independent Scotland. And under Alex Salmond - or any credible successor - the intention is to found Scotland on taking £40,000 per person in Scotland from the people of the rest of the UK. 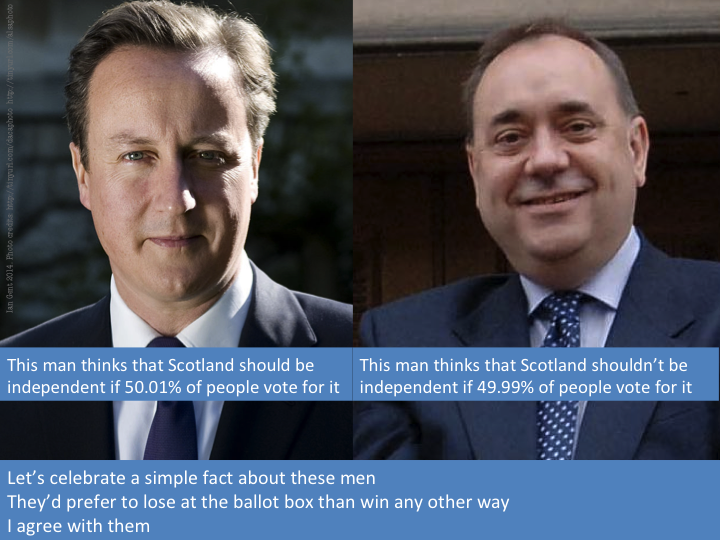 From Salmond's perspective, the best outcome is a 'no' vote by a narrow majority. If it's 'yes', the SNP will disintegrate as there is no common cause to hold it together and Salmond will be out. If a large majority for 'no', he'll be seen to have failed and will be out. But a close 'no' vote means he lives to fight another day and may well win the 2016 election with additional powers for Scotland. And he doesn't have the humiliation of conceding 'lines in the sand' as part of independence negotiations.